Celebrating Halloween with toddlers brings a certain element of innocence to the mix. With a toddler, it may not be possible to go out and party like you normally would, and trick or treating can get tiresome for your toddler very quickly. Safety is always an issue with toddlers as they are very naive and can be scared very easily. Here are some top tips to keep your toddler safe and still enjoy the holiday. Avoid scary costumes. Children, especially toddlers, are prone to night frights. It is also very difficult, if not impossible, for toddlers to separate reality from the “monsters” that they may see walking around. If you plan to dress up, make sure your child knows that it is you behind the costume and keep the costume simple; for example, go easy on the make-up. Trick or treating may not be the best idea with a toddler. If you do decide to take your toddler trick or treating, keep the trip short and visit just a few houses on your block. If your friends and family live close by, it is a good idea to visit those houses as your toddler will be more at ease with them than a stranger’s house. Any more than that and your toddler may not only lose interest, the costumes may also cause your toddler to panic. Hold a party at your house. This is a great way to enjoy the holiday and still keep it relatively simple for your toddler. Holding a party at your house as opposed to going to someone else’s party means that you can set the terms for your party and keep it toddler friendly. Invite other people who you know have toddlers to enjoy a mellow, yet festive Halloween party. Candy is a big issue when it comes to protecting your toddlers. Toddlers are not aware that some candies may be too hard for them to chew and pose a potential choking hazard. Keeping your child away from the candy bowl, however, can prove to be a bit of a challenge. Make sure the candy bowl is out of reach and that older children and adults know not to give your child any candy without approval from you. It is always best to be near your child just in case. Halloween can be fun for toddlers but safety must play an important role. 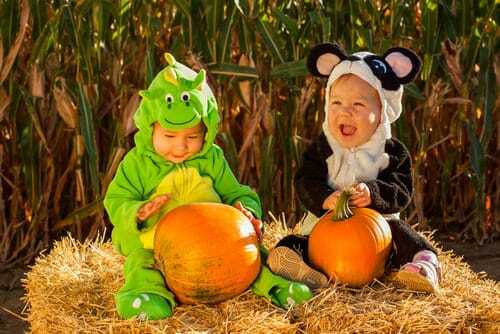 Toddlers are usually not able to separate reality from the costumes that may be around, causing your child to panic. Trick or treating is not usually a long event with toddlers, if you do choose to take them out. Visiting the houses of friends and family will help to keep your toddler at ease while still enjoying the trick or treating. Holding a party at your house is a great way to keep your toddler safe, yet enjoy the holiday. Always make sure that your child is not able to reach the candy bowl should they grab a hard piece of candy that may pose a choking hazard. By following these tips, you are not only protecting your toddler, but making sure they are able to join in on the Halloween fun as well.